Unlike a personal profile, a Facebook page can be liked by an unlimited amount of people, meaning you aren't limited to the number of folks you can interact with on a daily basis. On the other hand, a profile is limited to just 5,000 friends. It seems like a lot but when you run up against it and have to make the decision to remove friends in order to add others you'll be wishing you had a page instead! The process of becoming a fan of something on Facebook is much less involved than becoming someone's friend. All a user has to do to stay in touch with your future updates by becoming your fan is click the "like" button at the top of the page. On the other hand, a friend request requires verification by you, which causes extra work. Likes just happen automatically. By creating a page you get access to a tremendously valuable analytics tool called Facebook Insights. Insights lets you track and monitor activity on your profile, so you can see how many people clicked that link you posted last week or how many likes you've received in comparison to your previous amount. It's a great way to understand what your fans want, and it's only available if you have a Facebook page (not a profile). You also get access to like buttons, which means you can post them to your website, blog or anywhere else in order to gain more fans on Facebook. Not having access to a Like button in 2011 is kind of like not having a phone number. People expect it, so if you don't have one available you're missing out on a very important way to communicate with your prospect and current customers. "Profiles represent individuals and must be held under an individual name, while Pages allow an organization, business, celebrity, or band to maintain a professional presence on Facebook." 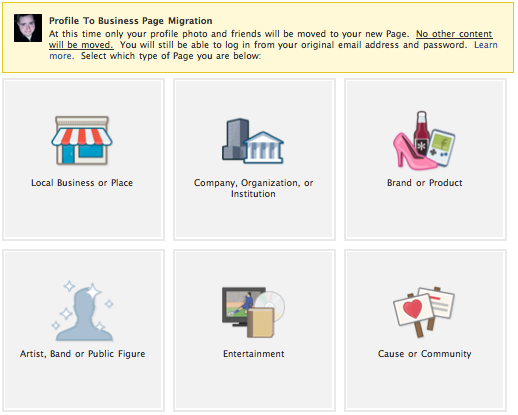 Essentially this means that Facebook could remove you from the website if you're a business that is set up with a profile instead of a page. All of your friends would be lost and you'd have to start over from square one. The good news is, you can make sure that DOESN'T happen by converting your profile to a page right now. In most cases, if you're a small business, I'd recommend choosing the "Local Business or Place" option. From there, just fill out your business's information to complete the conversion!